Tabitha Valentine had an idea and she ran with it. Or danced with it, actually. 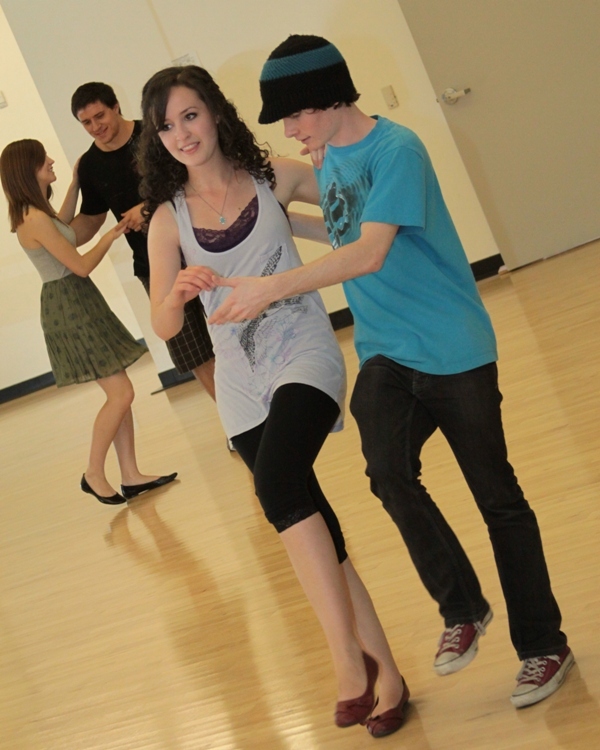 Valentine, a student in the College of Fine Arts and Production, wanted to join a ballroom-dance club at GCU last fall. Told there wasn’t one, she decided to form the club herself. (left) Tabitha Valentine and Ben Ren kick off the GCU swing dance club. “I had interest from others right away,” says Valentine, who launched the Lindy ’Lopes this semester. The club meets for practice on Friday afternoons in the Sanctuary, the dance and exercise room on the second floor of the Student Recreation Center. Last Friday, more than a dozen students turned out. The first few weeks have been devoted to learning the Lindy Hop, a swing dance that evolved in New York City in the 1920s and ’30s and was named for aviator Charles Lindbergh’s Atlantic crossing in 1927. “I fell in love with it two years ago and became addicted to it,” says Valentine, best known on campus for her leading roles in “All in the Timing” and “Inspecting Carol” in the Ethington Theatre Series. Swing is “good music, happy music,” she says. Valentine, also a figure skater, says she had been looking for a dance that would help with her on-ice choreography. She says swing’s social aspects can help students meet new people. Eventually, the Lindy ’Lopes will try out what they’ve learned at socials at the Fat Cat Ballroom in northeast Phoenix. Valentine says she’d also like the club to perform at nursing homes, where residents familiar with swing’s heyday would appreciate the entertainment the most. Arizona State University has a similar club, called the Swing Devils, that has been around for the past few years. Ben Ren, an ASU student, has been helping Valentine with the launch of the GCU club and assisting at practice. For more information, go to the Lindy ’Lopes page on Facebook.